What greater pleasure exists than popping sweet orbs of green out of their pod and into your mouth? Or even better, crunching through both the case and pea inside? Well, this little legume has a long history of making humans happy. And while no definite center of origin has been determined, dried peas have surfaced in the archeological record a good 12,000 years back! Cultivation probably dates to the time of Romans and Greeks, so we're talking about some pretty darn old crops here. For a more detailed account of the travels and adventures of the pea, check out the Vegetarian Paradise article. Peas are ridiculously easy to grow, especially in cool and moist climates (Seattle for the win)! They usually appear during the months of June and July - hey, that's right now! As nitrogen fixers, peas and other legumes are involved in a symbiotic relationship with rhyzobium bacteria that convert Nitrogen in the atmosphere to a form usable to the plant - all in exchange for nutrients and protection. This means peas are pretty self-sufficient...and nutritious (mmm, protein...)! I spent my morning on the farm searching for full-figured shelling peas to grace the CSA boxes. 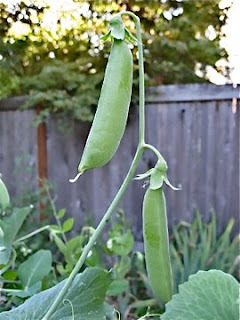 And, Sugar Snap Peas have made their debut this week in my backyard (take note of the photos). 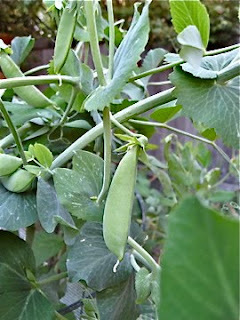 It is those sugar snap peas that take the prize for my favorite pod. This cross between a shelling pea and a snowpea is sweet, crunchy, and entirely edible. Personally, I'm a fan of munching these guys raw, but there are plenty of other perfectly delightful uses for peas. Smitten Kitchen has a fun pickling recipe, and the snap peas with radishes and dill is on the menu tomorrow night. Have a good time with Food and Wine's Quinoa and Snap Peas! I like this simple stir-fry, maybe adding in some pan-fried tofu to the mix. If you are willing to go to the trouble of shelling fava beans, this salad recipe sounds like a keeper. Finally, Food Network has a ton of possibilities, but this sassy pasta dish stands out. If you catch them early enough, pea vines are quite the delicacy in Asian dishes and spring salads!